Features: * Elasticated to the front with press studs for superb fit. * UV Protection. * Easy throw over design. * Designed to fit perfect. * 250 Micron thick plastic. * Crystal clear plastic for ecxellent visibility. * Black binding all around. * Small fold away for storage. Care: * Once wet clean with a dry cloth, keep in open in dry airy place until dry. * Never leave your child unattended whilst the cover is on stroller/carseat/carrycot. * Read product instructions and keep for future reference. Delivery: We send our products the same working day for next working dat delivery*. We pay our couriers to deliver the next working day within the UK however this is not always a guarantee for various reasons (tracking information can be provided upon request). We also deliver Worldwide, any purchases made outside of UK mainland will be issued a tracking number upon request. 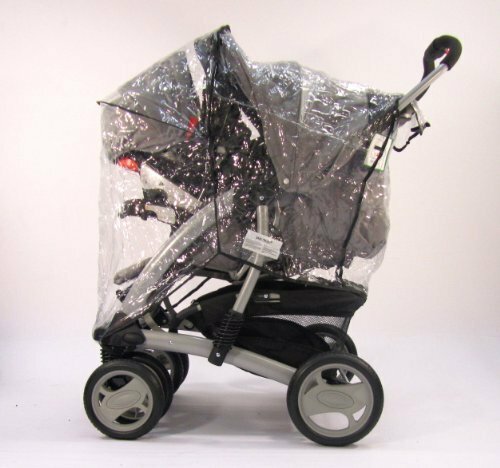 THIS RAINCOVER IS DESIGNED TO FIT GRACO OASIS TRAVEL SYSTEM PVC complies to EN71 Euro standards. PVC has UVA protection and is 250 micron thick and not 180 micron which is normally used on cheap rain covers or plastic. Our PVC is soft and supple unlike other PVC’s that stick together and are difficult to unfold. Carefully designed and professionally made in our factories. Rest assured this is the best quality/value product. (some of UK’s and Worlds biggest distributors of baby goods make many of their product in our factories) Some of our products can be found in highstreet stores at a substancially higher price! Features: * Elasticated to the front with press studs for superb fit. * UV Protection. * Easy throw over design. * Designed to fit perfect. * 250 Micron thick plastic. * Crystal clear plastic for ecxellent visibility. * Black binding all around. * Small fold away for storage.